• our sharing of your personal information with third parties and cross border. 2. If you have any questions concerning your personal information, please contact us at Click Here. 3. Personal information refers to all information about you as an identifiable individual, including your name, address, email address, telephone number, and identity number. • marketing, product research and development purposes. 5.1. Edcon uses all reasonable endeavours to put in place and maintain electronic procedures and systems to ensure accuracy and to eliminate risks of unauthorised access to, and loss, misuse or wrongful alteration of, personal information with reference to accepted technological standards. 5.2. 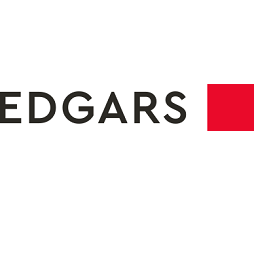 The Edgars web site uses an industry standard 128 bit Thawte Server CA certificate to implement Secure Sockets Layer (SSL) encryption to encrypt transmission of sensitive information between your browser and our web server. SSL security is among the best approaches available today for secure commerce transactions. Our security encrypts all of your personal information so that it cannot be read as the information travels over the Internet. 6.1.3.4 protect the personal safety or property of our customers or the public (if you provide false or deceptive information about yourself or misrepresent yourself as being someone else, Edcon will disclose such information to the appropriate regulatory bodies and commercial entities). 6.2 Edcon reserves the right to share non-personal, non-individual information in aggregate form with third parties for business purposes, for example with advertisers on our website or business associates and partners. This does not involve disclosing any personal information which can identify any individual consumer in any way. It is important that the information we have about you is accurate and up to date. If your personally identifiable information changes you may correct or update it online. We cannot be liable for any information that is inaccurate and/or obsolete. Edcon will provide you with access to any of your personal information it holds (except in limited circumstances recognised by law). If you wish to access your personal information or have an enquiry about privacy, please contact our Privacy Officer at:Click Here Before Edcon provides you with access to your personal information proof of identity will be requires. Edcon may in addition, charge a reasonable fee for giving access to your personal information if your request requires substantial effort on our part. If you are an existing customer, we provide you the opportunity to ‘opt-out’ of having your personally identifiable information used for certain purposes, when we ask for this information.